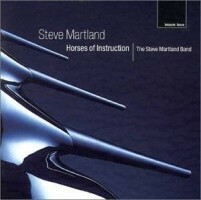 Steve MARTLAND: Horses of Instruction, Kick, Beat the Retreat, Mr Anderson’s Pavane, Principia, Thistle of Scotland, Eternal Delight, Re-Mix, Terminal. The Steve Martland Band. Black Box BBM1033. Distributed in the US by Harmonia Mundi (http://www.harmoniamundi.com). Steve Martland’s music bothers a lot of people. I remember reading about the controversy when his stuff began appearing on disc. (Babi Yar [Factory FACD266, 1989] was my introduction to Martland. It’s nothing like Shostakovich’s similarly titled work, but brash and minimal.). That an English composer would try to straddle minimalism and rock, and that there was an audience for such a thing, apparently upset the establishment. Martland studied with Louis Andriessen, and this disc sounds like an extension of the elder Dutch composer’s Hoketus and De Staat, where nonstandard ensembles fly through fast and intricate rhythmic patterns. Martland’s band includes piano, drum kit, guitars, saxophones, some brass, marimba, and one violin. They’re tight and crisp in what is largely high-energy music, and it’s a joy to listen to most anything played this well. The punch of percussion or electric guitar is never too loud, and the brass, especially the high trumpet, is accurate and dead on. Martland’s music is unpretentious and it is easy to decide whether you like it or not. The title work, Horses of Instruction, sets the mood. It’s fast, and sounds to me like the rhythms are irregular and constantly changing even though the pulse stays the same. We hear a blend of saxophones and brass in sustained chords or in detailed solos, and the rapid decay of drum, crash cymbal, and piano add variety. There’s a clever change of meter towards the end (similar to what Elliott Carter would do) that would throw most ensembles, and then we hear two fairly distinct groups happily bouncing away with their own music. It’s odd to hear a violin in this type of ensemble, but Kick employs an old fiddle tune and heaps on variation after variation. Martland is not at a loss for ideas in this format; in fact, other works put variations over a mostly constant bass progression. He tends to modify ensemble color and pitch material simultaneously, and is more inventive in this respect than similar-sounding pieces by Torke or Nyman. Mr Anderson’s Pavane is one of the few slow items on this CD. It starts with a series of chords in gently altering orchestration, and several instruments take turns on a stuttering and stately mournful line. It’s a delicate piece, and an occasional violin harmonic or soft marimba chord emerges from the texture. Honestly, I thought of the “Colors” movement in Schoenberg’s Five Pieces for Orchestra. Call me perverse, but my favorite track is Re-Mix, the shortest and oldest cut on display. Martland takes the wondrously simple three-note descending bass line (F-E-D) of Marin Marais’ La Sonnerie de Sainte Geneviève du Mont à Paris out for a romp. It starts with a fairly strict reading of the original and gradually accelerates into something slightly Klezmer and insidious. Get the disc just to hear that. I’ve been playing it for everybody who visits. Erkki-Sven TÜÜR: Architectonics I — VII. 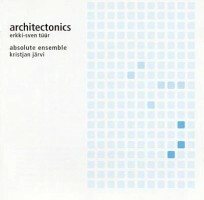 Absolute Ensemble, Kristjan Järvi (cond.). CCn’C 01812. Distributed in the US by Qualiton (http://www.qualiton.com/). I thought this was going someplace fun; it has good people on it, after all. The opening track starts with piano, bassoon, and violin frolicking through a 90-second pantomime imitating some 18th-century cadential frippery (the trio sets up a dominant seventh chord, G-B-D-F, that wants to resolve to C) before landing in a dark place of gritty percussion, saxophones, and electric violin. I anticipated a disc full of charm and wit on the basis of this beginning, but nothing else met that expectation. ” I don’t hear much of the driving rhythms of rock (you know I’m not an expert on this, but most of these works don’t build off a patterned beat). As for Renaissance texture, the instrumental lines don’t appear to follow or parody any rules of imitation, voice leading, and harmony. What is easy to hear is the quasi-improvisational nature of the music and the tight ensemble playing. Architectonics is actually seven episodes from Tüür’s output, 1984-92 (the notes call it a single work spanning ten years). The individual movements’ ensembles are taken from a chamber group of winds, strings, percussion, saxophone, electric guitar, and keyboards. The seven are presented in scrambled order (IV, V, II, III, VI, VII and I) and vary quite a bit from one to another, but independently — except for some isolated sounds which demand more development (electric guitar just short of feedback plus piano, high winds with chimes and bells) — they can feel a bit too much alike. Surprisingly, the music is rarely expressive and sounds as though it were written without dynamics (or with just one dynamic). Emphasis occurs by making everything louder or by punching phrases, and this seems especially true in those movements, or sections of movements, where piano is paired with another solo instrument. The last movement on the CD (1984) is a good wind quintet all by itself. Interestingly. Some passages in it remind one of Arvo Pärt. Since both Tüür and Pärt are Estonian, I wonder if they’re touching upon a specific Estonian type of singing or musical tradition, or even using a folksong. 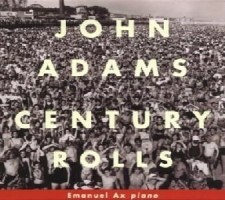 John ADAMS: Century Rolls, Lollapalooza, Slonimsky’s Earbox. Emanuel Ax (piano); The Cleveland Orchestra, Christoph von Dohnányi (cond. ); The Hallé Orchestra, Kent Nagano (cond.). Nonesuch 79607-2 (http://www.nonesuch.com). Now this is Adams I like. 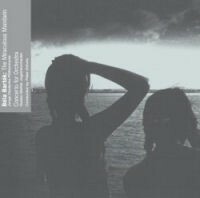 I couldn’t get into Adams’ recent El Niño, even though the just-released Nonesuch recording (79634-2) is polished and persuasive. El Niño makes a big statement that’s lost on me. Adams has never asked, but if he did, I’d tell him to step back from his current and contemporary topics and try out some Sophocles or Homer, whom I think would be fertile ground for his style and inclinations. I prefer Adams when his music wiggles and bops around, and this disc does just that. Century Rolls is a buoyant piano concerto, and this taping captures the Cleveland Orchestra and Emanuel Ax after they’d taken it out for a spin many times. I’d like to see this become a classic. Adams’ true instrument is the orchestra, and each movement is captivating. The first (“First Movement”) descends from the orchestra’s upper regions with layers that prepare us for lots of motion and complicated cross-rhythms. It’s hard not to think of clocks or metronomes, each winding down or sounding out hours and tempos at its own pace. The second movement is “Manny’s Gym,” a pun on the dedicatee’s name as well as on the underlying musical reference, a slow dance in 3/4 much like one of Satie’s familiar Gymnopédies. I also hear connections to the slow movements of Saint-Saëns’ piano concertos, where the soloist often enjoys fast-moving material against the orchestra’s more sedate tread. The finale’s title comes from a delicious misunderstanding. “Hail Bop” is a great name for something musical, but Adams thought he had overheard the name of a comet that came by our planet a few years ago. It sounds to me like a big set of variations with a perky and catchy syncopated theme that keeps coming back. Lollapalooza is the shortest of the three works, a punchy and fast concert piece in the vein of Adams’ The Chairman Dances, an extended foxtrot for orchestra that’s a big favorite of mine. (There’s a way-old recording on Nonesuch 79144, and a more recent one on EMI CDC 55051.) Distinct choirs of instruments spin out mechanized riffs; the low brass gets a five-note motive that intones the word “lollapalooza” (C-C-C-Eb-C). Slonimsky’s Earbox is a darker affair — tougher to find the same level of frolic and exuberance the other two possess. Without consulting the notes, I had presumed this was an older effort, but actually it dates from 1996, the same time as Century Rolls. Named for Nicholas Slonimsky, the great author and crafter of encyclopedias on a wide range of musical subjects, this episodic work passes by territory reminiscent of Sibelius, and there’s a moment that sounds almost exactly like a bit of Stravinsky’s Petrushka. Béla BARTÓK: Concerto for Orchestra, The Miraculous Mandarin (complete). 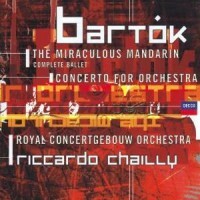 Royal Concertgebouw Orchestra, Laurenscantorij Chor (Mandarin only), Riccardo Chailly (cond.). Decca 289 458 841-2 (http://www.universalclassics.com/). Béla BARTÓK: The Miraculous Mandarin (complete), Concerto for Orchestra. Junge Deutsche Philharmonie (Mandarin), Gustav Mahler Jugendorchester (Concerto), Peter Eötvös (cond.). Budapest Music Center Records BMC CD 058 (http://www.bmcrecords.hu/). Distributed in the US by Qualiton (http://www.qualiton.com/). Right off, these two CDs are excellent sets of Bartók’s most important works for orchestra. In an ideal world, I would take Chailly’s Concerto for Orchestra and Eötvös’ The Miraculous Mandarin. If you’re blessed with unlimited disposable income, you should seek out both. The disc from the less-familiar Budapest Music Center Records will be a bit harder to find, but Eötvös’ Mandarin is worth a listen and a must-have for Bartók fans. I don’t know where I’ve been not to have noticed that most every recording of The Miraculous Mandarin released these days is of the complete ballet. I’m more used to the Mandarin Suite — two-thirds of the ballet with a sudden stop before the chorus entrance and some of the most interesting orchestration. Hearing the entire ballet was a revelation, and Eötvös’ Mandarin is the most consistently energetic and powerful reading I have heard. I suspect that this youth orchestra had more rehearsal and working time with Eötvös than is customary in most conductor / orchestra relationships, and as a result the tempo changes are delivered in confident and exact detail. Bring your score and you’ll be amazed at what Eötvös brings out — how accurately he takes all the tempo markings and nuances. Chailly’s Mandarin is less immediate, as if it had been more distantly miked, perhaps to compensate for the chorus. You can get into a good argument by asserting that Mandarin is more of a concerto for orchestra than Concerto for Orchestra itself. Mandarin has more pages with interesting and clever orchestral effects, if you’re willing to see beyond Bartók’s Hungarian-tinged Impressionistic style. But the Concerto is about sections in an orchestra playing together, and sections alternating between dominance and support. The Concerto is a textbook for learning about balance and orchestration. Take the second movement, “Game of Pairs,” where a melody flows through various pairs of instruments, each pair playing a specific interval apart (flutes in fifths, clarinets in sevenths, and at the very beginning, bassoons in sixths, sounding like staggering drunks). Perhaps the Concerto for Orchestra is a wry joke played on us by grand-master Bartók: Too proud to accept the needed commission from Koussevitsky, he resorted to subterfuge when recasting what may have been intended for a ballet. The Concerto is a work of its time: The “Interrupted Intermezzo” contains a beautiful melody from people who were probably wiped out in World War II. In the same movement Bartók also takes some cheap shots at Shostakovich’s Leningrad Symphony, and for those orchestration fanatics, there’s a trombone glissando at measure 90 that can’t be played, and everyone assumes Bartók should have known that. The last movement has those odd and intentionally moronic developments of the grand trumpet theme (the just-barely-canonic passage where the strings “develop” the theme by wiggling just one of the notes). It’s as if Bartók were spoofing less capable composers, or demonstrating how to fill up pages. Later on we get long stanzas of nearly impossible string chromatics played sul ponticello so that they’re inaudible, anyway. I should mention the two different endings. Both Chailly and Eötvös take the Concerto’s alternate ending that almost everybody does. (The original ending is so abrupt it must have been a joke: Bartók was an expert on timing and pacing.) Slatkin / St Louis Symphony use the other (pairing the Concerto with Mandarin on RCA 09026-61702-2), but except for the shock of hearing something almost never played, the sound quality is fuzzy. Better to go with the majority, and take either the Chailly or Eötvös. 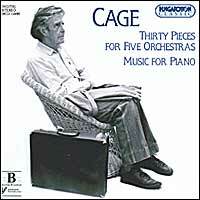 John CAGE: 30 Pieces for Five Orchestras, Music For Piano Nos. 4-19, 21-84. Savaria Symphony Orchestra, Peter Eötvös, László Tihanyi, Dieter Kempe, Zsolt Serei, Katalin Doman, Mark Foster (conds. ); Zoltán Jeney, András Wilheim, László Vidovszky, László Sáry, Barnabas Dukay (pianos). Hungaroton HCD 12893. Distributed in the US by Qualiton (http://www.qualiton.com/). Originally taped in 1986, here are two good realizations of Cage scores. The 30 Pieces for Five Orchestras involves a large orchestra subdivided into five vastly unequal groups. Each group has its own conductor, and each group proceeds through its own set of 30 pieces independent of the other four groups (which actually makes it five times 30). Each piece lasts about a minute (the whole takes 29:50). Two types of musical material come through immediately: long sustained tones and simple ostinatos. Over the complete span, we hear an incredible variety of orchestral colors and sounds, and this performance is endearing in its gentleness and air of simplicity. Instruments come and go, yet the pace of the work continues in a relaxed manner. The five conductors are László Tihanyi, Dieter Kempe, Zsolt Serei, Katalin Doman, and Mark Foster. Peter Eötvös supervised the entire effort. This realization of Music For Piano Nos. 4-19, 21-84 is exceptional. The five pianists are Zoltán Jeney, András Wilheim, László Vidovszky, László Sáry, and Barnabas Dukay. (Sáry’s disc of locomotive sounds on BMC was cited a few issues back and Jeney, Serei, and Vidovszky’s works figure in many recital and anthology CDs of contemporary Hungarian music, including one of pieces for cimbalom that I’ll get to soon.) Most executants would take these 80 items and perform them separately or sequentially. (Steffen Schleiermacher’s huge undertaking of the complete Cage piano oeuvre covers these works in Volume 2 [MD&G CD613-0784]. I honestly don’t know his set.) András Wilheim was determined to realize them simultaneously, and through real-time performance and tape, each of the five pianists presents his 16 pieces within a predetermined 28-minute span (well, 28:19). The result is a wonderful curtain of any and all the sounds a piano can produce. We hear the prepared-piano and inside-the-piano repertoires, knocking on the body of the instrument, etc., all rolled together in a spatially rich recording. You might think these works would sound tedious or at least very similar, but they don’t bore and are intrinsically tasty and varied. Detailed notes explain Cage’s intentions and how the performers have understood and extended them. Though lasting under an hour, this disc has the ring of authority, and complements ambitious Cage series from hatART and Mode. Hans HUBER: Symphony No. 1 in D minor, Op. 63, “Tellsinfonie”; Symphony No. 7 in D Minor, “Schweizerische.” Stuttgarter Philharmoniker, Jörg-Peter Weigle (cond.). Sterling CDS-1042-2. Distributed in the US by Qualiton (http://www.qualiton.com/). Hans Huber (1852-1921) is counted among the greatest Swiss composers of all time. The brief entry in Grove’s notes how Huber endeared himself by writing nationalistic operas and symphonies instead of churning out the more common genres of Swiss musical expression (works for male chorus or piano). The opening motive of Huber’s Symphony No. 1 (1881) is bold and memorable. It outlines the triad and emphasizes the dominant, much like the similar weighty themes of Mozart’s and Brahms’ D-Minor Piano Concertos. In the traditional four-movement form, this first symphony is a well-built and complete statement that evinces a mature grasp of orchestration. But Huber never approaches the lyric or emotional power of his betters. In fact, after such a potent opening, the rest is a bit of a letdown. However, listeners who have dipped into lesser-known symphonies from this era (the very early Dvorák or even the symphonies of Borodin) will find pleasure discovering this First. To my surprise, I found it growing on me after repeated hearings. The Seventh Symphony (1917) shows that Huber kept to a conservative path. At times he seems to have caught a bit of Strauss, and the confident lower-brass writing combines with the hint of a chorale to reflect a touch of Wagnerian largesse. 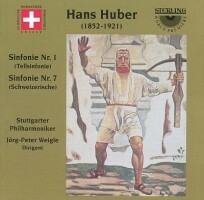 I am fascinated by symphonic efforts from this time, so I’m glad to have discovered Huber. The Stuttgart Philharmonic makes a good case for this music; they seem to be working through all nine symphonies and some other orchestral titles.
. To round out the CD they’ve added Giacomo Manzoni’s Masse: Omàggio a Edgard Varèse. It took me years to find a used copy of the Manzoni. One disc has Schoenberg’s piano works, and another offers Pollini’s take on the Boulez Second Sonata. Several years ago I heard Pollini live in Boston. It was a singular concert — all Chopin, I think — so most folks will be excited about the Chopin and Beethoven reissues in this set. Yeah, I can get excited about them, too. There’s a single-disc sampler with 13 complete movements sequenced in the order they were recorded (289 471 000-2). I get a chuckle out of the fact that one of the complete movements is 39 seconds of Webern, the acrobatic and canonic second movement of Variations, Op. 27. Some readers will notice I haven’t lived up to my promises. The excuses aren’t worth mentioning, except that you should visit our newly reorganized archives, and be prepared to spend at least 12 hours a day there. A wonderful stack of electroacoustic music awaits, I have some books to talk about, some things to say about Xenakis, even some historical discs, and if I’m lucky, I’ll have a chance to go on and on about Helmut Lachenmann.